I am not updating this pack very often due to hand injuries. When I DO update it will usually be to keep the pack working in new versions, only occasionally adding new textures. FAQ and Change Log with links to past versions. Permissions: You're welcome to modify the packs to fit your own needs/dungeons/etc, but you cannot make profit off of the textures themselves, claim the textures as your own, or repost the packs without giving credit and linking back to the originals. Thank you! This means: Yes. Use the packs for the dungeon you made (that's kind-of the point)! If you're using the vanilla textures, you could say something like "download [texture pack name]." And if you need to alter the textures slightly for your dungeon, say something like "I altered [texture pack name] by carlotta4th, so here's the version you need for this dungeon: [link to your version. A normal, non-adfly non-profit link]" (You can certainly link your dungeon world to adfly--just not my textures). Enjoy testing! Room options for old Aperture, or new Aperture. Get to know Mr. Johnson and Caroline! Use REAL portals! (textures for iChun's Portal Gun mod included). The 32x32 packs use "Faithful 32x32" for the base textures (originally made by Vattic and now updated by XMrVIzzy). Great pack, I highly suggest giving it a look. - Version 1.12: The 16x version of the pack was discontinued. - Version 1.9: "Modified Portal" and "Precisely Portal" were combined into one pack called "Precisely Portal." 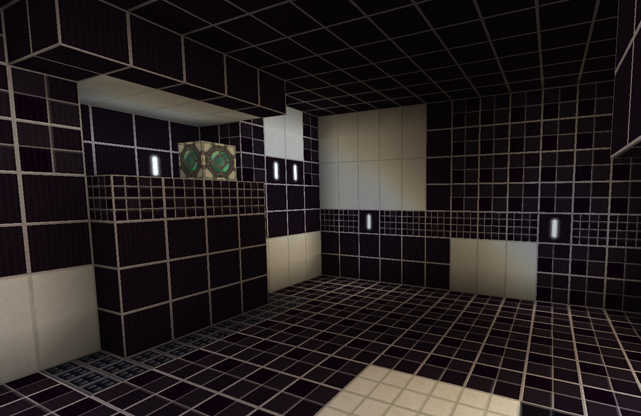 - Alpha: The first portal texture pack (ever) was made by Cosine. When they stopped working on it they gave me permission to continue the pack into Beta and beyond--so, in essence, this was the very first portal pack available to Minecrafters. 2. Open Minecraft. In-game, click on "Options" then "Resource Packs." 3. Drag downloaded pack into this folder. 1. Use your computer's search function ("find" or "search") and type in "Run"
4. Open minecraft and it should be there. Q: This pack is mostly what I want for my dungeon, but I need to change it a bit. Is that okay? A: Short answer: yes. But read the "permissions" section first so you know how to do this properly. Enjoy making your dungeon! Q: What are the two block high walls? A: Andesite and Polished Andesite. Layer them over each other to get the appearance of two-block high walls. More "dirty" wall versions of the same wall are Granite and Diorite. Q: Make the companion cube gravel or sand so it has physics! A: Sorry, the cubes are going to stay as hardened clay. If you need them to be sand for your map feel free to switch around the textures. Q: Why don't you animate the 16x16 cores like you did the 32x32 cores? A: 16x16 is a really tiny space to do animation in and it was hard enough getting the 32x32 ones to work correctly. I am not planning on animating much of anything in the 16x16 packs. Q: Can I get the world file you used for the pictures? A: Sort-of. Most of these pictures are just model rooms made in my personal world solely for screenshots, but I did make a dungeon way back in Beta 1.7 that some of the pictures came from. Just keep in mind that it was made a looooong time ago (before creative was even added), and the game (and packs) have changed a lot since then. 7/22/18: Discontinuation of 16x support. 32x will continue, but version 1.12 is the last time the 16x packs will be updated (also removed adfly for the main download link). 32x Precisely Portal updated to 1.13: Mojang renamed every texture in file and code so most time was spent fixing all that. New: wolf, spawn egg images (for nonvanilla mobs), cod, buckets of fish, horse armor, saddle, spruce trapdoor, blue ice, seagrass. Updated: texture for "oak trapdoor" is now "dark oak trapdoor." 11/2/17: 1.12 (2). Brown terracotta core moved to light grey, New black, white, grey, and brown terracotta. All core animation code updated (and animations that were broken fixed). This is the last time the 16x packs will be updated, but the 32x packs will continue. 7/10/17: 1.12 (again). New: lime/green and red beds, Elytra, Husk, Stray, Normal/smooth granite. 7/2/17: 1.12. Fixed url links (which had reverted to version 1.10 for some reason). Also fixed: language files, recipe book and crafting guis. New: light/heavy pressure plates, white "relaxation pod" bed, totem of the undying, and Vindicator, Evoker, Witch, Illustionist. 3/30/17: 1.12 (sortof) update. Changed Personality cores from wool to Terracotta. New: Glowstone/Redstone lamp, Brewing stand and potions, Sign, Brick, Prismarine (and different variants), Sea Lanturn. 3/20/17: 1.11 update. New: Evoker and Vex mobs, Zombie villagers, Observer Block,Animated Command and Structure blocks (includes the different variations). Diorite/polished diorite is now a "dirty" two block high wall. 5/26/16: 2nd 1.10 update. New: ender dragon, hopper, anvil, furnace, and cauldron. Updated crafting table. 5/19/16: Mini 1.10 update. New nether wart, nether wart block, red nether brick, cactus, magma block, black/grey/white wool. The "obsidian" texture is now hardened black clay (so it can go with the other cubes) and there is a new obsidian block. I've also included a grey "crusher plate" version of the magma block in alternative textures. Fixed: 32x Nether Quartz. 5/14/16: "Modified Portal" and "Precisely Portal" were combined into a single pack called "Precisely Portal." All cube related items are now hardened clay, dirt/reeds are nature based, two-block high walls are made with Andesite/Polished Andesite, Pumpkins are robo pumpkins, Mushrooms are turrets, and all Rails are Light Bridges. -Entirely new textures: Shullock, end stone, purpur block/pillar, end rod, chorus plants/flowers, netherrack/netherbrick/quartz ore, doors, red/yellow/cyan/brown/black/gray/magenta/white glass, dropper, hardened clays, chicken(mob), and iron bars. -Updates/fixes to: redstone, spruce logs, dark oak sapling, wet sponge, coarse dirt, daylight sensor, coarse dirt, lava bucket, and language files. 4/18/16: Packs converted to 1.9 snapshot. Added the different kinds of boats, betroot stew and ender crystal icon. Slightly altered/fixed the daylight sensor, beetroots. Command blocks and the clock have reverted to default textures for now due to structure changes on Mojang's end, and all the remaining vanilla 16x textures have been updated to their "Faithful" 32x counterparts. 1/8/14: Three year anniversary release! (1.8 snapshots). New: slime block 'repulsion gel' from Portal 2 (all slime-related items changed blue to match), barrier block, steve/chell skins updated to new skin format, and various gui updates. Added Sayomi_Inoue's command block (slightly altered). Andesite, diorite, and granite are default for now. 12/5/13: 1.7 update. Oak planks texture is now "dark oak" instead. New: acacia/dark oak saplings. stained glass, podzoil, red sand, and various flowers/ferns. 9/6/13: (Fixed) 1.6 update. Portal Gun textures now show automatically when you have the mod downloaded. Also preparing for 1.7, so there are new salmon, puffer, and clown fish. Also new packed ice and poppy flowers. 7/2/13: 1.6 update. Packs are now resource packs, and will not work in any version lower than 1.6. New: log tops, horses, donkey, horse armors, lead knot, and coal block. Alternate textures are also in a separate folder for easy copy/pasting. 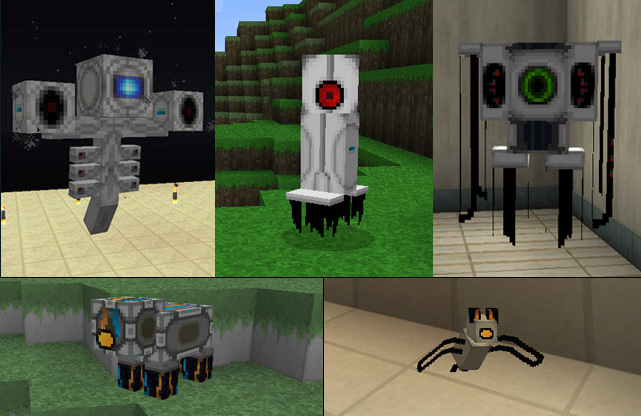 3/26/13: Updated Portal Gun mod textures (to version 1.5). They are now in a folder called "mods" inside of the packs. 3/13/13: Official 1.5 update. Nothing new from pre-releases--just general tweaking. 1/8/13: Two year anniversary release! 1.5 pre-release (2). New: hopper, dropper. Fixed: spider/enderman/dragon eyes, tnt minecart, clock, compass. Animated: 32x32 personality cores (cloths 1/2/3/4/5/6/9/10/11/12/13/14), potaTOS, nether quartz ore (and all 16x ore shine animations). 11/2/12: Quick 1.4.3 update. Updated language files and added "Wait" music disc. 10/26/12: 1.4.2 update. New: Pigs, bat, wither boss/skeleton, witches, villager zombies, villager emotion bubbles, beacon, carrots/potatoes, pumpkin pie, item frames, flower pots, skull heads, fishing carrot, nether star, and ender chest. Updated: apples, fish, potion effect icons, leather armor, misc gui changes, fire charge (now combustible lemon), and sandstone. Modified Portal: Mobs are now the Precisely Portal variants and Precisely Portal: Melons are now melons and potatoes are potatoes. 8/02/12: 1.3 update. New guis (trading/book/etc), emerald ore/block, tripwires, made ores/glowstone shine (only in patched 32x), and updated records. Cocoa beans and bonemeal reverted to default since they aren't strictly dyes. 5/17/12: 1.2.5 update. New portal gun textures (thermal beam, redirection cubes and etc. ), book and quill items (gui pending), redstone colors. Fixed 32x light blue dye. -"Modified Portal:" Fixed Mycelium. 3/9/12: 1.2 update (reuploaded on 3/12/12 to fix missing .lang files, 32xModified paintings, and transparent ghasts). Added: default jungle items/cat/sandstone, temporary "stone square block." New: Redstone lamp, End brick, Endportal casing, pumpkin helmet texture, iron golem, 32xArmor, 32xwolves, and fixed 32xclock. -"Precisely Portal:" new pumpkin/jack'olanturn, snow golem, 32xcows. -"Modified Portal:" New squid. 2/8/12: One year anniversary release! Added default jungle items/cats, new xp potion, updated dragon egg, pork/beef, ores, stronghold brick, more splash txt, and shinier tools. Updated mobs: most 32x32 mobs/npcs completed, zombie is now a defective turret, ghast is a burned companion cube, zombie pigmen are frankenturrets, blazes are just... better looking, and mooshrooms have the new mycelium growing on them. "Precisely Portal" had an updated clay brick. 1/19/12: 32x32 packs were added (using Vattic's "Faithful 32x32" as a base)--all terrain/art files and items are done in the 32x packs, armor and mob are default 16x until a later update. Other changes: New dispenser, eng.lang file (manual update). "Precisely Portal" melon is now a giant potato, melon slices are normal potatos, and glistering melon is potatOS. "Modified Portal" had the iron door change to the circular door. 1/15/12: 1.1 update. New crystal/"tunnel" textures for the end, GUI screens, grass, updated long grass, sandstone, wool, and cubes. 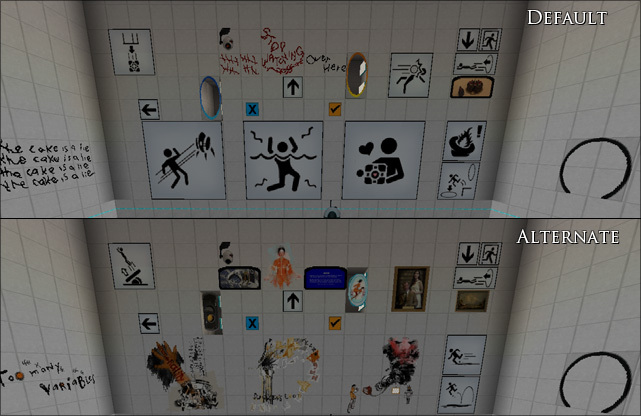 Art files were split up into two separate files: normal, and alternative/extra "portal 2" paintings. "Precisely Portal" also had the brick texture changed from the 1970s look to the Portal 1 look, and cactus reverted to default for now. 12/08/11: Second 1.0 update. New minecart, boat, records, blaze powder, ice, bed, moon phases, layered clouds, and red button (in alternatives, not available in default). 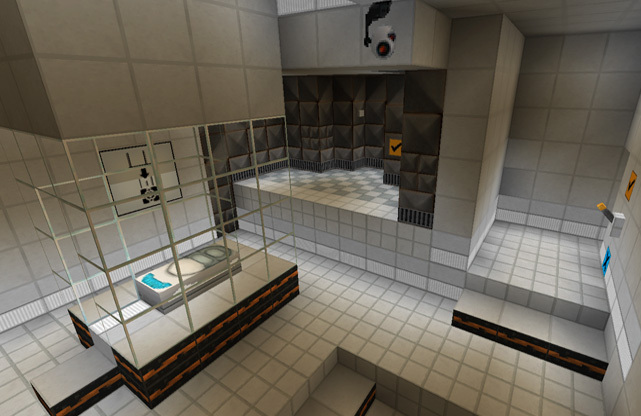 "Precisely Portal" also had minecart tracks changed to a sort of Portal 2 "lightbridge" look. 11/18/11: Minecon 1.0 update (it's called "candidate 2," but the official update didn't change anything): New villagers, and new "win" text (manual change). 11/09/11: Second 1.9 update. "Modified Portal" wolves are now husky. Both packs had updated title panoramas, enchantment tables, soul sand/nettherack/netherbrick, enderman pearl/eyes, glistering melons, maps, pumpkin vinettes, giant mushrooms, netherwart, book particles, and potions. 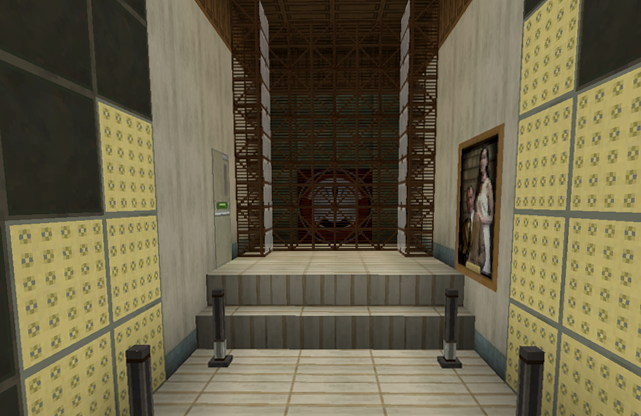 Iron Bar texture was reverted back to default, and there's a new "chell" painting available in the alternatives. 9/22/11: 1.9 Pre-release (not yet completed. Many textures are default 1.9 until a new texture can be made for them). Lava slime, blaze, and lilypads added. Updated crafting grid, inventory, and furnace. "Modified Portal" mushroom cows included, and "Precisely Portal" normal cow was textured as well. 9/20/11: Official 1.8 is up now. Spiders updated and stronghold textures fixed. Endermen and chests were added. 9/7/11: Beta 1.8 pre-release. Changes: EVERYTHING HAS BEEN SMOOTHED! 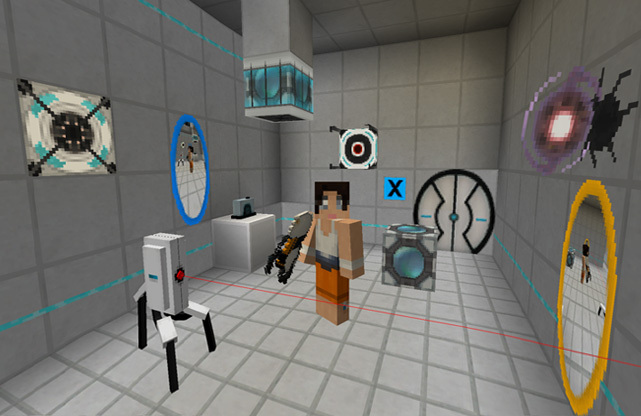 Both packs: texture shears, chest-in-cart icon, fishing rods, sticks/arrows are darker, and alternate cubes and doors from Portal2 were included as well as a turretdispenser. "Precisely Portal" had the brick change to a "portal here" block. "Modified Portal" got a new cow skin and flowers. 9/6/11: Finished my dungeon! I also linked the texture packs and dungeon to adfly... basically, all that means is you have to wait 5 seconds before you can download them. They're still free. 8/30/11: Re-skinned skeletons, slimes, armor, records, maps, saplings, long grass, and shrubs. Default character skins and the minecraft logo were added. There are also new paintings (Not all currently show in default Minecraft, but they're available as alternatives): Glados Eye (1x2), Aeiral faithplate (2x2), spiketrap (2x2), and repulsion gel (2x2). Paintings were slightly rearranged to accomodate the new ones. For "Precisely Portal" you have new robot sheep, wolves, and squid. For "Modified Portal" you now have a mini cactus as the dead shrub. Precisely Portal only: Skinned some animals to look all roboty. Squid, sheep, and wolves. Modified Portal only: Dead shrub is now a small cactus. 8/22/11: Glowstone and torches were altered for both packs. An alternate, "cleaner" glowstone was included below in both packs as well for those who may not like the blue look. Precisely Portal had a combustible lemon replace the flint and steel, a potato GLaDOS and defective turret as flowers, and a rocket turret as a dead shrub. 5/26/11: THIS PATCH WILL BREAK YOUR DUNGEONS. A LOT. Sorry, but it needed to happen. Hatches have replaced the mossy cobblestone grate texture, so the mossy cobblestone was changed to be the old "fling" texture for both packs. Precisely Portal sandstone defaulted to vanilla (but will probably change later if I get a good idea for it), and dirt and cobblestone were switched so you won't sound like you're walking on dirt in dungeons. New: Shrubs. 3/3/11: Beta 1.4 update. Nothing remarkable (only cookies were added). I wouldn't have bothered to update for such a small change, actually- but what the heck. It's an easy update. 3/27/11: Stone was smoothed out a bit, 2x1 paintings were re-arranged (so we get the most important ones first). The circle door was given corners, and glass was smoothed out. Splashes were shortened, too. title screen and inventory cleaned up to look better... this update just made things a little better overall. 3/25/11: Both packs were updated. The largest change is that I added a LOT more paintings, but normal Pumpkins were also changed to differentiate between them and jack-o-lanterns. 3/17/11: Both packs were updated. Pumpkins were changed to accompany the new "pumpkin helmet texture" (which will probably be refined and cleaned up later). Dispensers were re-textured. "Precisely Portal" also had sandstone changed to the "fling" block ("Modified Portal" will have to wait for more block options before it gets that). 3/9/11: Both packs were updated. Basic equipment was skinned and dyes were simplified. "Modified Portal" had the clay block switched to the normal cube (it still makes sense to me that way). 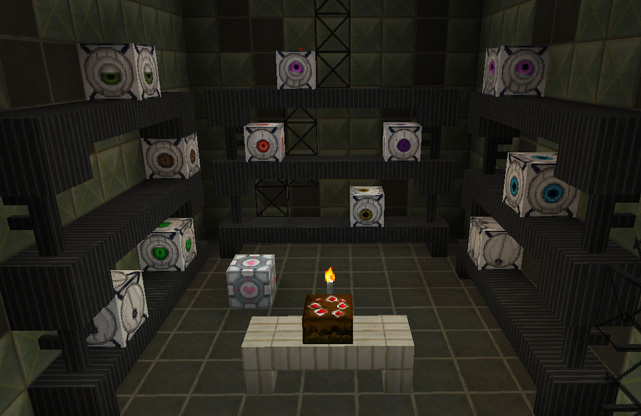 3/4/11: "Precisely Portal" companion cube and normal cube switched to wool. If more blocks get added to the game, this could potentially change, but for now it's good. 2/28/11: "Precisely Portal" had stone/cobblestone/bricks switched around so you can make rooms look more like portal. That same pack also had a slight companion cube change and I added a blue/orange cursor (the modified portal will get the same cursor in its next update. But it's not worth re-uploading the file for that small of a change). 2/27/11: White wool was changed to be a white cube for furniture purposes. Black and grey wools were switched around a little bit to compensate for that. New painting was added, and the dispenser texture was changed (no more see-through walls). 2 versions of the pack are now available. 2/24/11: Okay, I've got a better fix up now. Redstone delayers and beds were skinned (beds altered from MrMagical's bed skin) . The redstone graphics were fixed (although they're not even half as cool as it used to be...). Ghasts are probably done. 2/18/11: Messed with mob skins a lot to make them look more portal-y. Also added the creeper skin (which is now my favorite mob). 2/12/11: Skinned TNT, jukebox, bookshelf, sandstone, and nature items (like cactus, reeds, etc.). The pack is probably about 90% completed, now. 2/10/11: Skinned crafting table and chests. I also finally made wood black, since I REALLY want those fence-piston thingies. Fixed up the stray pixels on ice. 2/08/11: Re-skinned signs, netherrack/soul sand, edited the camera artwork, and spiced up the inventory GUI a bit. 2/07/11: Took over the Alpha pack from Cosine (with permission) and updated it to Beta. Most basic terrain/item textures are done. Art is done. Armor skins are done. Skeletons, zombies, zombie pigmen, and spiders are done. Hmmm... I wasn't going to post the pack until it was more completed, but I changed my mind on that. So it's available now. I'm sure you guys could have helpful suggestions on texture changes and the sort. So let me know what you like/don't like. I can't promise to change it, but if you have a really good idea I'm not too proud to say no. Now someone needs to make a mod to make the portals work. Looks awesome, any screenies of the baddies? I think there are a few mods like that, but I'll do some more research and post the links when I have time (I've got a few finals that come first right now). I don't have any screenshots of the enemies, yet, because they kept mauling me when I tried to take their picture. Especially those spiders! Man, those guys can see you from anywhere. Update: Wood is now black (hopefully it still looks like wood, but I had to make it black to make the fences look right). Crafting table and treasure chests are now skinned, too. Please note that the sides of furnaces look really weird. This is because the dispenser needs to have those sides, and unfortunately, the furnaces share the same graphic. So just hide furnace sides with something, okay? If that's a really big deal for you, though, let me know about it. I could reconsider having visible sides, even though the dispenser looks so much better without them. Update: I skinned TNT, the jukebox, bookshelves, sandstone, and nature items (like cactus, reeds, etc.). The basic terrain is probably 99% completed, so the big projects left are mob skins and making a dungeon. GlaDOS: "Quit now, and cake will be served immediately." HALP! When I open the texture pack folder and select it, IT DOESN'T WORK!!! [quote=EPICZEUS]HALP! When I open the texture pack folder and select it, IT DOESN'T WORK!!! Hmmm... I tried changing the upload directions because I assumed that the "Open texture pack" button worked. But it might not. 2. Use your computers search function ("find" or "search") and type in "Run"
5. Open minecraft and click on "Mods and Texture Packs" in the main menu. 6. The pack should be there now. Enjoy! Make the creepers into the auto-turrets, its the perfect size and shape no? THIS NEEDS TO CONTINUE HAPENING. Also requesting someone make something awesome with this and a mod of AdventureCraft, that way you can mess with triggers! Considering this pack was only posted on Monday and I've updated 4 times since then... I'd say it is certainly going to "continue hapening." Just check my to do list for planned changes in the future of the pack. As for the trigger thing, I have no knowledge in mods or coding, so I'll probably leave that particular project to someone else. =) But I AM planning on making a dungeon once I can figure out how to use MCmapper... and possibly once my finals are over. Real life comes first. I tried to make zombies or skeletons look turret-esque, but their arms just made it look weird. But creepers? I hadn't thought of that... maybe I'll try it out. I wouldn't be able to make them look exactly like turrets, of course. But perhaps inspired by them. EDIT: Whoah. The result of this needs some fine tuning, but it's now my favorite mob! I love to see those little guys scribbling on over to me! (The creeper skin will be included in a future update when it's more finalized). This is my officially my favorite texture pack of all. Thanks a bunch for making this! I really enjoy the look of it. I have a companion cube in minecraft! OMG! i will never take out this texture! Really...Thank so much! I'm 100% more excited with minecraft now. The download is broken, can you post a mirror? Jack Allan, Ballistic Engineer. At your service. can you upload the world where you made the screenshots?